From a sold out 1994 publication of 1000 limited editions. Overall size: 20 3/8" x 31"
Image size: 17 3/8" x 26"
On April 19, 1967, then-Major Leo K. Thorsness and his backseater Electronic Warfare Officer Captain Harold E. Johnson, were part of a flight of four United States Air Force F-105 Thunderchiefs on a "Wild Weasel" mission over North Vietnam. 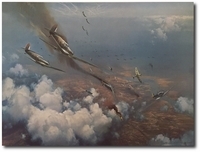 Three of the four aircraft were severely damaged during combat. The crew of Thorsness' wingman was forced to eject into the jungle below. With his own fuel supply critically low, Thorsness evaded anti-aircraft fire and confronted enemy fighters as he circled the air crew. 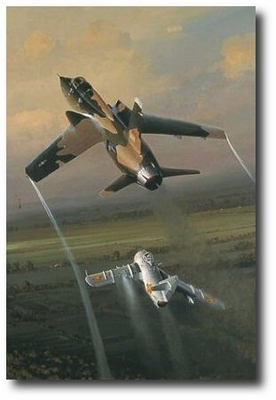 Phillips captured the moment when Thorsness encountered the MiG-17 in this great print. Thorsness was awarded the Medal of Honor for his bravery and Johnson received the Air Force Cross.